A giant 800-house development near Wetherby Racecourse is not sustainable a councillor has claimed this week. The comments came from Conservative councillor Alan Lamb as preliminary plans were discussed by the Leeds City Council’s city plans panel on Thursday. A council report outlined the plans, which also include a new primary school, shops and a park. The site is set to include 800 houses off Racecourse Approach, which is currently earmarked as a rural area. But the application has received significant opposition from those already living in Wetherby. Speaking at the meeting, Coun Lamb, a Wetherby councillor, said: “There are so many things wrong with this site, it is difficult to know where to start. “Is this sustainable? Clearly it isn’t. It does not meet any accessibility standards. There is a two-hourly bus service that doesn’t run on Sunday and stops at 5pm on an evening. “This is a site that would be entirely dependent on the motorcar for people to get in and out. “The schools issue is significant. There would be 400 houses built before the school opens. Schools in Wetherby will be oversubscribed. He added that according to a local housing needs survey, at least 50 per cent of new houses in Wetherby need to be one and two bedroom to accommodate the town’s elderly population, and that these plans did not include a single one-bedroom property. “This is an historic market town - this would alter its character and lead the way for urban sprawl. Coun Lamb was asked to identify better sites, but declined not comment. Speaking on behalf of the developers, Becky Lomas told the meeting the proposals complied with national and local planning policy. Commenting on the viability of the scheme, a council officer said: “I believe this is the sustainable choice and the preferable choice. 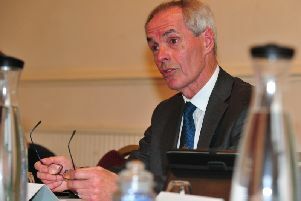 Coun Peter Carlill (Lab) said: “There does need to be work on this before we can feel comfortable. “We are extremely wary of overly car-dependent development, so this would be an opportunity for a developer to think very seriously about sustainability. Coun Colin Campbell (Lib Dem) said: “There is no way you can even describe this site vaguely as sustainable’. Coun David Blackburn (Green) said: “As it stands at the moment, quite honestly, it just does not work. “Unless you use your own car, you are not going to live there. Coun Dan Cohen (Con) added he thought it was a “terrible application”. The meeting followed dozens of objections from locals to the plans, including local ward members and Wetherby Town Council. A report from Leeds City Council, the authority tasked with eventually deciding on the application, said it has had detailed discussions with the applicants on road issues, as well as drainage and the proposed primary school. It concluded: “There are concerns over whether a comprehensive development can be achieved through this planning application given the illustrative master plan put forward, and therefore more work on this aspect is required. A detailed planning application for the site is yet to be submitted.